Panasonic have updated their successful Toughbook CF-19 with a complete upgrade of the internal specifications, it's now faster, bigger, brighter, better connected, and lasts an extra hour longer. The new Panasonic Toughbook CF-19 includes the latest 3rd generation Ivy Bridge Intel Core i5 Processor & Chipset to ensure the device is capable of handling the most intensive applications. Even though the processor is more powerful than the previous versions Panasonic have still managed to maintain the CF-19's unique fan-less design, which uses energy optimisation and optimised heat pipes to cool the full performance, standard voltage CPU. Panasonic have also managed to squeeze another hour of battery life out of the Toughbook – it's now up to an impressive 10 hours without a recharge - by using low voltage RAM module and adding a new ambient light sensor and Transflective Plus screen Technology which helps to reduce power consumption and enhance battery life as no backlight is required in bright environments. 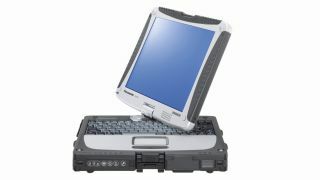 Panasonic have also upgraded other parts of the Toughbook including increasing hard disk drive capacity from 320GB to 500GB with 128GB and 256GB SSD options available, and upgrading the wireless connectivity to Bluetooth 4.0 Smart Ready technology to connect mobile workers faster and more efficiently. The Toughbook CF-19 also continues to offer an optional Ericsson F5521gw HSPA+ (DL: 21 Mbps) module with wireless ready connection manager. It includes a dedicated wireless switch allowing users to switch connections on and off to improve operating time.